Thikana Bed and Breakfast in New Delhi is an excellent place for short-term (one night) or long-term stays in the city. It is very close to Gulmohar Park, one of the more pleasant areas in New Delhi. Located in the south part of the city, it is close to Delhi International Airport, and offers a green and relatively quiet environment, but still with easy access to the main tourist and business locations around town. We recently chose Thikana as a place to stay before our morning flight instead of one of the characterless corporate hotels by the airport. 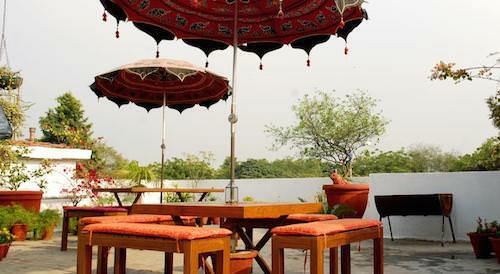 It is very quiet because it is located on a tranquil residential street off one of the main thoroughfares of New Delhi. Since opening in 2008, Thikana has catered to tourists and longer-staying corporate guests. Thikana offers five rooms, each with a modern ensuite bathroom. The rooms are elegantly decorated with color and light to create both a sense of space and intimacy. The beds are large and comfortable. There are two separate sitting areas with warm rugs, Indian artifacts, and comfortable seating, as well as a large breakfast table and separate computer desk. Breakfast and free Wi-Fi are included. South New Delhi is considered to be the most affluent of all the residential districts of Delhi, and many of the neighborhoods like Hauz Khas have become a hub for designer boutiques, restaurants, art galleries and design studios.